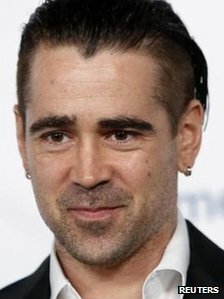 Seven Psychopaths star Colin Farrell was the toast of the Irish-American community in Los Angeles, as he was honoured at the Oscar Wilde awards. The Dubliner, whose work includes Minority Report and Miami Vice, flew in from New York to accept the award. In his acceptance speech, he thanked his parents “who are rumoured to have genetically made me Irish” and the US for the opportunities it had given him. Other honours went to make-up artist Michele Burke and Michael Burns. Burns, vice president of film studio Lionsgate, and Oscar winner Burke picked up awards for their contribution to film. Producer Paula Wagner, who has worked with Burke on films including Vanilla Sky, said that when Burke first began working in prosthetics, there were no women in the industry. But Burke persisted and it wasn’t long before she became known as “the blood lady” because she created the best fake blood in the business. The Kildare-born artist also designed the make-up for Oscar nominee Jessica Chastain in The Heiress. The Oscar Wilde awards, named after the famed Irish writer, were created by the non-profit US-Ireland Alliance. Earlier in the evening, Farrell spoke of his admiration for Anglo-Irish Oscar nominee Daniel Day Lewis, who could win a historic third Oscar for his leading role in Steven Spielberg’s Lincoln on Sunday. “Daniel is very special… he is incredible,” said Farrell, who revealed he had recently finished shooting Saving Mr Banks, which also stars Tom Hanks and Emma Thompson. The film is based on the making of the Mary Poppins movie and has already been tipped by the Hollywood Reporter to pick up an Oscar next year. Farrell plays Emma Thompson’s father in the film, which he said had one of the “most beautiful scripts I’ve read in 15 years”. The Oscar Wilde’s were held on the roof of Bad Robot, JJ Abrams’ production company. The sci-fi director was recently named as the director of the next Star Wars film, Star Wars Episode VII. He said the announcement was “an incredibly surreal thing” but told BBC Radio 5 Live “it was too early to talk” about a release date or give any details about the film’s content.